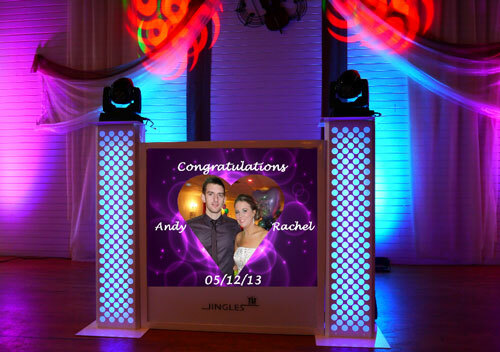 Welcome to the Jingles Professional Wedding Disco page and congratulations on your forthcoming wedding. 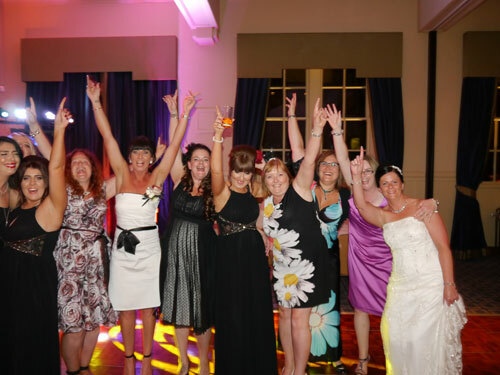 Jingles Wedding Disco is recommended by many local wedding venues including Easterbrook Hall, Friars Carse Country House Hotel and Hetland Hall Hotel. 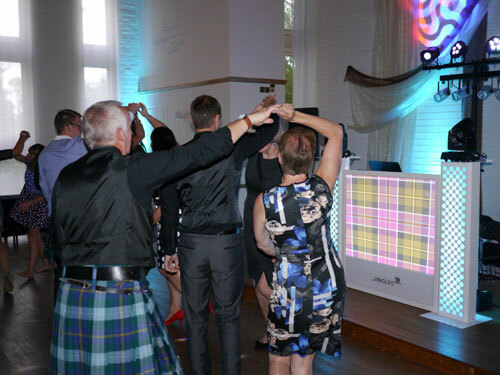 The mobile disco is based in Dumfries and Galloway, South West Scotland and covers all of the area including Gretna and Carlisle. Your wedding entertainment takes up a large part of your day. You will want to remember it for all the right reasons. I believe that I have the experience, musical knowledge and commitment to make your wedding the best it can be. Although I can and do DJ all types of events, weddings are where my passion lies. I absolutely love the whole wedding experience, from that first phone call or email, to helping future brides and grooms to plan their special and very important day. 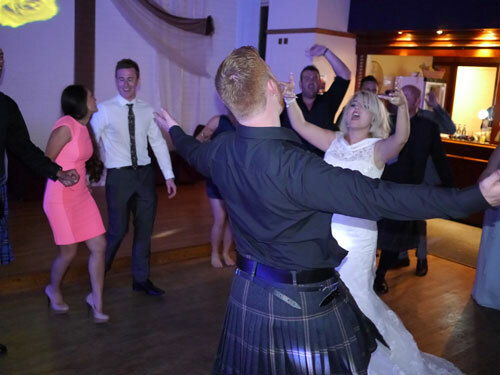 From your entrance and first dance as husband and wife, to the very last dance of the evening, Jingles will treat your special event with the care and attention to detail it requires, making it a fantastic experience. I guarantee a stress free quality service that is second to none. You spend a long time choosing the dress, the invitations and the venue so that they all look good. I think it should be the same with your wedding disco. 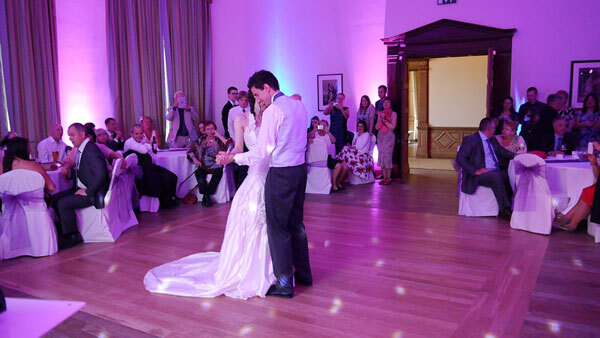 Jingles Professional Wedding Disco has been designed for weddings so that it looks amazing! 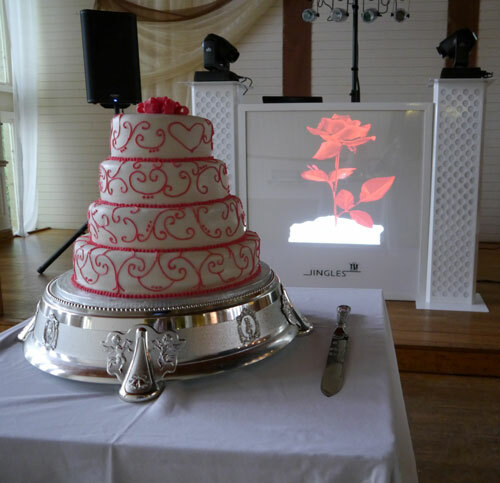 I am more than happy to show photos of how Jingles Wedding Disco looks. (Not all discos are like this!) It tends to get as many compliments as the music! 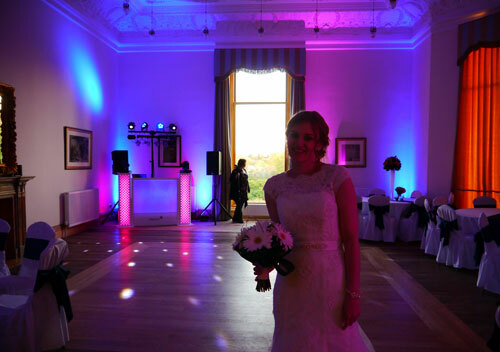 If required you can personalise the disco to compliment your wedding colours. Why not have your names and the date on our personal message screen. There are many designs and colours available. You have a say in what I play! It is very important to me that the music is right for you and your guests of all ages (and at the right volume!). I am happy to accept a playlist before your event. This allows me to find out in advance the type of music you require. I also put request cards on the tables to allow your guests to choose some of the music as well. This can be a good way to encourage your guests to mix. 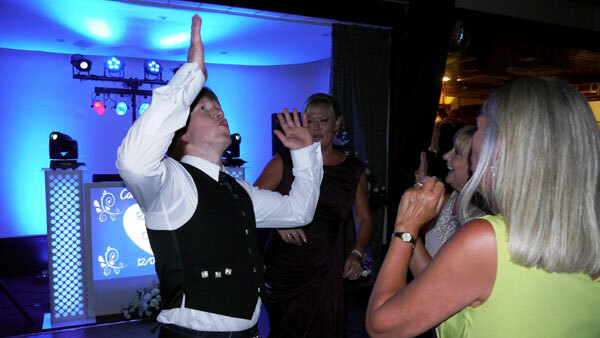 A selection of Scottish dances can be incorporated into your list if required. 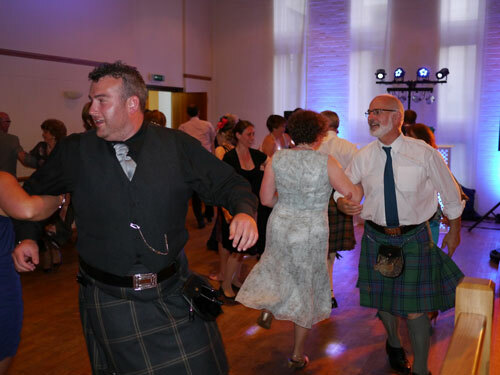 Don’t worry if you or your guests have not danced to Ceilidh music before. I am more than happy to talk everyone through various dances. Jingles offers the option of a local meeting (free of charge) prior to booking to discuss your requirements. When you have booked I also provide the option of a meeting (again free of charge). This works best about a week before your wedding. 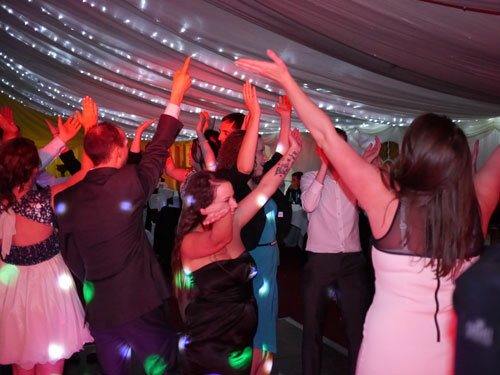 It allows us to go over the final details of your music, your first dance and who you would like to join you on the dance floor during your first dance and also how you would like the rest of the evening to be. 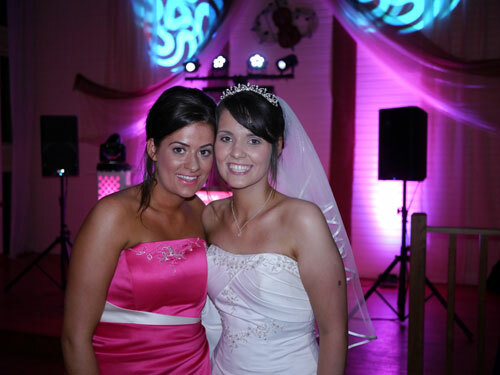 I can work closely with you to make sure you have the wedding entertainment and style of disco that you want. Attention to detail to make your night all you had hoped for… and more! 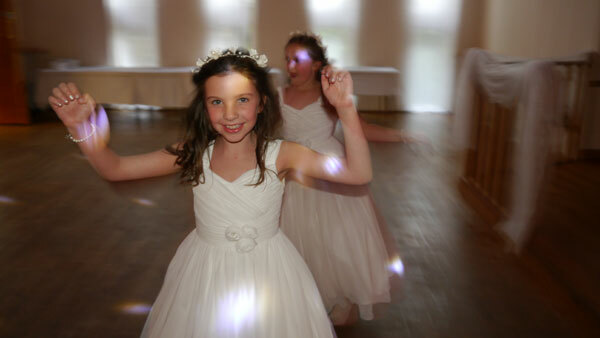 Happy to show photos of our disco set up. Beware of those who don’t! 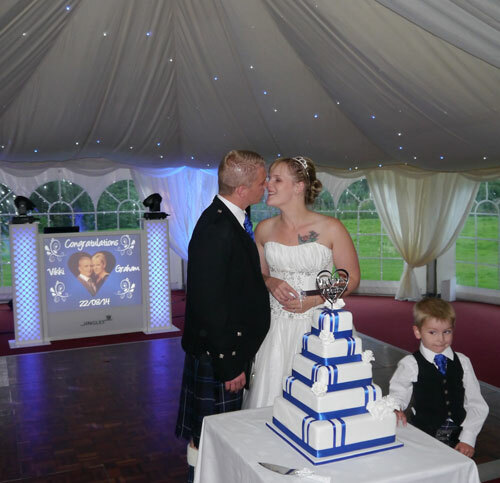 “Mike, Joe and I can never thank you enough for making our wedding evening magical. The dance floor was never empty and the room was always full of smiles. 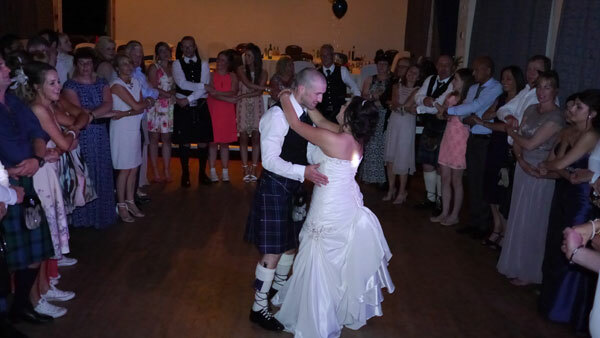 Jingles Professional Wedding and Party Disco is based in Dumfries and Galloway, South West Scotland.